Select Other from the drop down at the top. Leopard's firewall has been moved and changed. It is in System Preferences > Security. Eliminating Problems: Page 4 As you have probably came from there. A simple split of the two versions of System Preferences > Sharing > Firewall tab showing the Panther (10.3.x) and Tiger (10.4.x) versions as separate pictures. 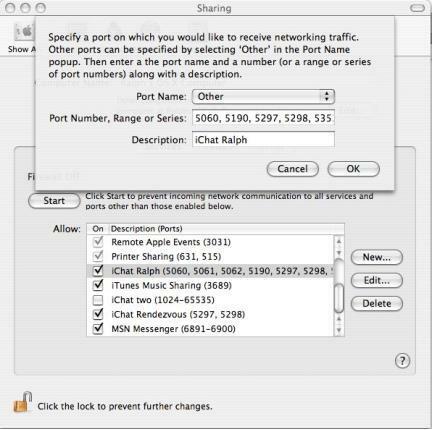 Includes a table after that that shows the Protocols used on each port for the Tiger Firewall.